You might remember I reviewed Parrot Carrot last year, and loved its emphasis on fun with words. Here’s a new children’s picture book by Jol and Kate Temple, again illustrated by Jon Foye. 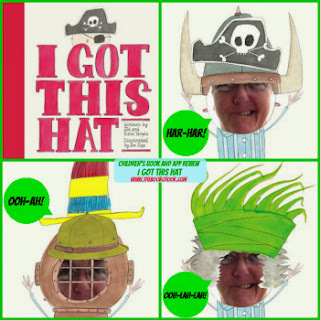 I Got This Hat was published by ABC Books, an imprint of HarperCollins (2013). I Got This Hat is a sturdy, quality publication, perfect to become a child’s new book friend. Foye’s illustrations are gentle, with muted colours but tons of character. The storyline is simple, but kids will take off with all the possibilities of different hats and lots of opportunities for dramatic play. The free I Got This Hat app (iTunes USA and iTunes Australia)is the perfect companion to the book, above. Children can choose from a range of hats to add to the book’s hero or their own photos, taken with the iPad/iPhone camera. It’s also possible to add multiple elements to a photo e.g. a viking horn and a pirate patch to a cowboy hat. I love the possibilities here for engaging kids in inventing their own stories. The pictures can be saved to the camera roll, and would make great writing prompts. As you can see in the collage above, we have an explorer searching underwater for Mexican Fighting Fish, a Viking pirate - a Virate?, and a silly chook who constantly strives for sartorial magnificence. Kids could weave stories around multiple characters and hats, and will have loads of fun dressing up their long-suffering relatives! Have you finished all your Christmas shopping? If not, consider the possibilities of doubling your chid’s fun by grabbing the book AND the app! Embedded below is a video where you can learn more about both. Be sure to check out the website too! Find more Children's Book Reviews on The Book Chook by clicking Reviews in the right sidebar. Check out my other iPad App Reviews on Pinterest.